In one lifetime, the Rebbe's influence was felt throughout the entire Jewish world. Wherever Jews are: in Hawaii, in Hong Kong, in Alaska or Australia, there you will find a Chabad-Lubavitch Rabbi, a direct personal emissary of the Lubavitcher Rebbe, Rabbi Menachem Mendel Schneerson, of righteous memory. There you will see him/her reaching out to Jews and rekindling the flame of Jewish life. Lubavitch went and still goes everywhere. Above all, Lubavitch went before anyone else — and at a time when it was fraught with immense danger — to the former Soviet Union. The USSR was surely one of the greatest systematic attempts in all of human history to extinguish the "Ner Tamid" — the continuous flame of our faith. And Lubavitch reached out to the Jews of silence to keep the spirit of Jewish Judaism alive... and succeeded in doing so! It was risky, it was almost impossible, and because it was almost impossible, Lubavitch did it. Chabad recognized — under the Rebbe — no boundaries. It was risky, it was almost impossible, and because it was almost impossible, Lubavitch did it. I remember the one occasion that I spent Rosh Hashanah together with the Rebbe in 770 Eastern Parkway, Lubavitch World Headquarters in Brooklyn, NY. And still then they were talking about an event that happened some years before, I think 1956. Each year the Lubavitcher Rebbe would lead thousands of Chassidim along Eastern Parkway to do Tashlich [the prayer done at the side of water to symbolize the throwing of the sins in to the water] on Rosh Hashanah at the Brooklyn Botanical Gardens. That year there was a tremendous downpour, and so powerful was it, that there was no one else out on the streets. When the Chassidim following the Rebbe arrived at the park, they found the gates of the gardens closed. What do you do? The garden is closed, it's locked, the gates are barred. Completely undeterred, the Rebbe looked at the seven or eight foot metal fence and proceeded to climb over it. And if the Rebbe climbs over a fence and you're a Chassid, what can you do but follow? That year in Lubavitch they recited the famous saying of the Rebbe Maharash, the fourth Chabad Rebbe: "If you meet an obstacle, and you can't go under then you go over. And I say that is it is actually preferable to go over than to go under!" And I often ask myself why? What drove the Lubavitcher Rebbe? Lubavitch recognizes no closed doors, no boundaries. Uforatzta – sprout out. It used and still uses every modern technology of communication, Cable and satellite, Mivtzah campaigns and Mitzvah mobiles. Lubavitch, before it was ever heard of in other circles, went to Jews that the other Jews forgot, to tiny isolated communities, to university campuses. Jews on drugs, to Jews in prison. The Torah says, "If you are scattered at the ends of the heaven, from there the L-rd your G‑d will gather you and from there will He bring you back." And was there ever a religious leader in Israel who took that verse so to heart and so astonishingly became a partner with the Almighty Himself in bringing back from every corner of the Jewish world. And I often ask myself why? What drove the Lubavitcher Rebbe? I don't know. And who will know. One day we will tell our children's children that we were privileged to live in the same age as him. From a lecture by Lord Rabbi Jonathan Sacks. 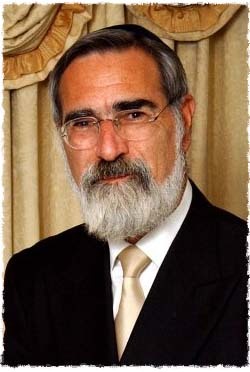 Rabbi Sacks is the former Chief Rabbi of Great Britain and the British Commonwealth. To read more writings and teachings by Lord Rabbi Jonathan Sacks, or to join his e‑mail list, please visit www.rabbisacks.org.